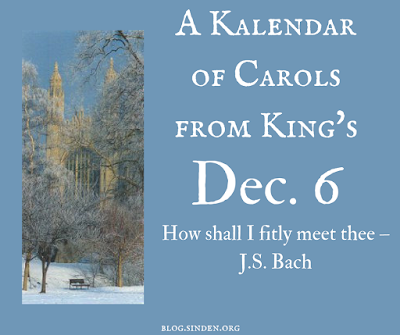 So far, we've covered the opening hymn, Bidding Prayer, In the bleak mid-winter – Harold Darke, Adam's Fall – Richard Elfyn Jones, and Love came down at Christmas – arr. Stephen Cleobury. In regards to this service, movements from the Christmas Oratorio have been employed from time to time. In particular, the recitative "And there were shepherds" followed by the chorale "Break forth, O beauteous heavenly light" were fixtures of the service under the tenure of David Willcocks. They were sung after the Bidding Prayer as the Invitatory. I don't clearly recall hearing the Bach the last time it was sung at this service in 2000. This chorale is sung to the tune most churchgoers know as "O sacred head now wounded" or "O sacred head sore wounded" which is most often sung in Holy Week. This means that people who don't know any better will complain about this chorale.